Fortunately for me, I didn't get a chance to move around a lot and survey the field. I got stuck in a corner seat (again) at table 2 with the with MH62, El Pinata, Texas Crint, 3 Jims and a Dan, with Alan rounding out the field. I started the tournament card dead and even when I thought a re-raise might win a pot, I saw 8 2 off suit and didn't have the intestinal fortitude to pull that move. I won a pot with AQ off suit when I limped into a near family pot at the 25/50 level. A passive play, but I was trying to set a baseline with the players I don't see regularly, get them to assume it was better than AQ if I raised in later levels. I stayed right around even, but mostly paying my blinds and folding until a series of hands starting in the 100/200 level. An Under the Gun raise to 575 at 100/200 with AK off was met with button shove from James the Dog Wagger-er. It would have cost me half of my remaining stack, about 2500 to call. I tanked for some time, trying to figure out how big a pair I was up against. There was something about his body language that said he was strong, but was worried. I couldn't decide if it meant Pocket Kings and he didn't want to be called with an Ace, or if it were Queens or Jacks. Hindsight says it was too tight a fold, but fold I did, thinking a better spot would be right around the corner with the button coming my way. I was shown pocket Jacks when my cards went dead. 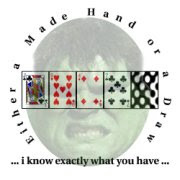 The next few hands were a sequence of me getting beaten up. I flopped a Queen with a King kicker on a [Q | 4 | 6] board after paying my blinds, bet out 500 and was raised to 2000 by Dan. I know I'm beat, he either limped with 4s or had A Q. The hand that hurt the most was the better spot I was hoping for a little while earlier. Under the gun or close too it, I wake up with Pocket Kings. I raise to 575 still at 100/200 leaving me with about 3000 chips behind. The Dog-Wagger-er flat calls me, and we're heads up to the flop. With all the lay downs I've made so far, I've got to believe he called me with a big ace, maybe if I'm lucky Queens. I check the flop of [Ace of clubs | RAG | RAG], assuming he'll bet about pot and I can get away from it. He's smart, keeps me on the hook for 500 more, and when the Jack of clubs falls on the turn, I get the feeling he's got Ace Jack, or maybe even pocket jacks, and is afraid of what he might think is a club draw. Either way I was done with that pot ... I was done with it when the Ace hit. Some blinds pass and with about 2500 in my stack at 300/600 I limp with 8s 8c in early position, hoping for a raise somewhere, so I can shove and flip for it. I don't get the raise, but I do see a magic flop of [8d | K | 4s]. MH62 Shoved for 1925, and my last 1900 went in right behind it. He showed 8h 4c. The turn or river put another 4 on board and as much as I had been feeling like a punching bag earlier I can imagine MH62 had it worse ... I just don't know what he was seein'. And that's it. My tournament didn't technically end there, but it did. But some shoves, and folds, and I stayed between 3000 and 3900 until we moved to the final table. I drew a seat in the blinds for the last few minutes of 300/600 and didn't pull he trigger by the time the blinds got back to me when they were 500/1000. End Game. 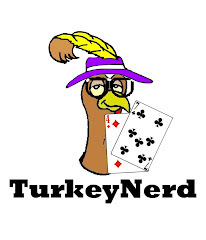 I'll be back tonight with some final table talk.